The definition of a golf links is a golf course built on sand left by the sea, influenced by the natural forces such as wind, rain, vegatation and terrain. Designed by Golf Course Architect William G. Robinson, Ocean Dunes Golf Links is an 18-hole unique, challenging experience. With a par of 70, and a slope of 124, it is set in the sand dunes of the Oregon Coast. This true Golf Links, with the native plant materials such as Scotch broom, wax myrtle, shore pines and native rhododendrons offers the golfers a memorable setting. 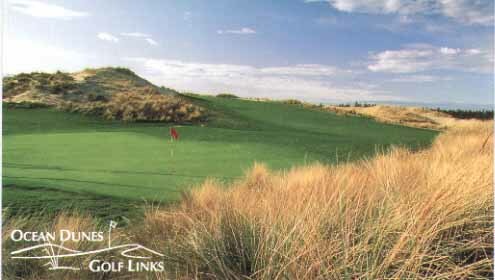 Ocean Dunes offers links style pot bunkers, a double green, sand dunes, beach grass, great drainage and beautiful views. The course has narrow fairways which will challenge the best golfer.